DIY History | Transcribe | Social Justice | I.C. Notebooks 1 | 1971-10-29 Invoice: Rental of tuxedo for CNPA ""Midway""
1971-10-29 Invoice: Rental of tuxedo for CNPA ""Midway""
Mail To THE UNIVERSITY OF IOWA Purchasing Department Iowa City, Iowa Center for New Performing Arts DEPARTMENT NAME UNIV ORDER NO 29 October 1971 DATE VENDOR NAME AND ADDRESS Mr. Dennis Swanson 1040 Newton Road Iowa CIty, Iowa ZIP CODE VENDOR ADDRESS NO. VOUCHER AND INVOICE TERMS, INVOICE DATE, VENDOR INVOICE NO. 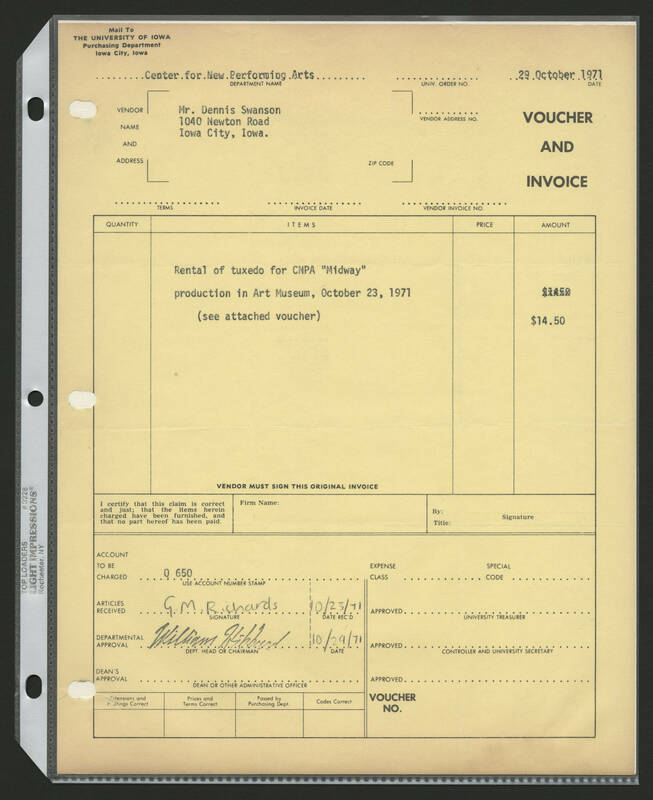 QUANTITY, ITEMS, PRICE, AMOUNT Rental of tuxedo for CNPA "Midway" production in Art Museum, October 23, 1971 (see attached voucher) $14.50 VENDOR MUST SIGN THIS ORIGINAL INVOICE I certify that this claim is correct and just; that the items herein charged have been furnished and that no part hereof has been paid. Firm Name: By: Title: Signature ACCOUNT TO BE CHARGED Q 650 USE ACCOUNT NUMBER STAMP ARTICLES RECEIVED G.M. Richards, 10/23/71 DATE REC'D DEPARTMENTAL APPROVAL, William Hubbard DEPT. HEAD OR CHAIRMAN, 10/29/71 DATE DEAN's APPROVAL, DEAN OR OTHER ADMINISTRATIVE OFFICER [Extensions] and [footings]Correct, Prices and Terms Correct Passed by Purchasing Dept. Codes Correct EXPENSE CLASS, SPECIAL CODE APPROVED, UNIVERSITY TREASURER APPROVED, CONTROLLER AND UNIVERSITY SECRETARY APPROVED VOUCHER NO.